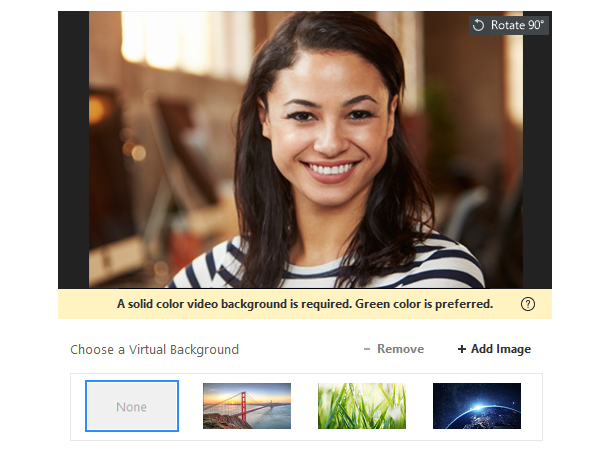 The virtual background feature allows you to display an image as your background during a Zoom Meeting. 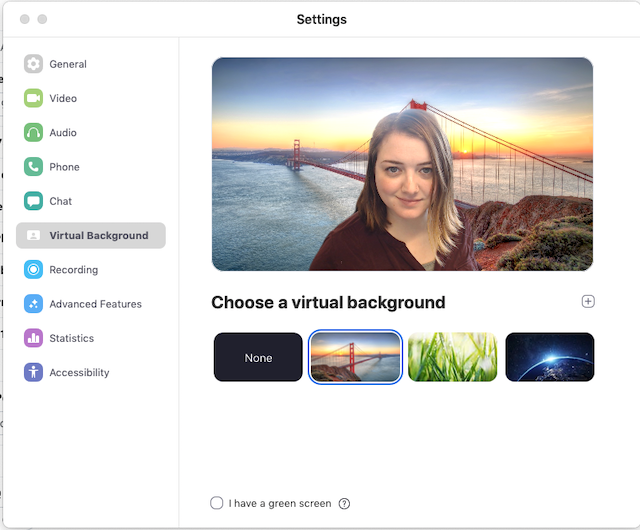 This feature works best with a green screen and uniform lighting, to allow Zoom to detect the difference between you and your background. Watch a video about this feature. You can also upload your own images as a virtual background. There are no size restrictions when adding your own virtual backgrounds, but we recommend cropping the image to match the aspect ratio of your camera before uploading it. Example: If your camera is set to 16:9, an image of 1280 pixels by 720 px or 1920 pixels by 1080 pixels would work well. To achieve the best virtual background effect, Zoom recommends using a solid color background, preferably green. Recommended green screens from Webaround or Amazon. Higher quality cameras result in a better virtual background. See camera recommendations for details. Use uniform lighting and color. Do not wear clothing that is the same color as the virtual background. Sign into the Zoom web portal as an administrator with permission to edit Account settings, and click Account Settings. Navigate to the Virtual Background option on the Meeting tab and verify that the setting is enabled. Note: Users must logout of the Zoom Desktop Client and login to it again for this setting to take affect. Sign into the Zoom web portal as an administrator with permission to edit User groups, and click Group Management. If the setting is grayed out, it has been locked at the Account level, and needs to be changed at that level. Sign into the Zoom web portal and click My Meeting Settings, if you are an account administrator or Meeting Settings, if you are an account member. Note: You must logout of the Zoom Desktop Client and login to it again for this setting to take affect. Open the Zoom application and click your profile picture then click Settings. Note: If you do not have the Virtual Background tab and you have enabled it on the web portal, sign out of the Zoom Desktop Client and sign in again. Click on an image to select the desired virtual background or add your own image by clicking +Add Image. Ensure that you are using a solid background color. To disable Virtual Background, choose the option None. Check I have a green screen if you have a physical green screen set up. You can then click on your video to select the correct color for the green screen. Click on an image to select the desired virtual background or add your own image by clicking +. In the Zoom desktop client, tap Settings. While in a Zoom meeting, tap More in the controls. Tap the background you would like to apply or tap + to upload a new image. The background will be automatically applied. Tap Close after selecting the background to return to the meeting. To disable Virtual Background, open the virtual background options again and choose the option None. 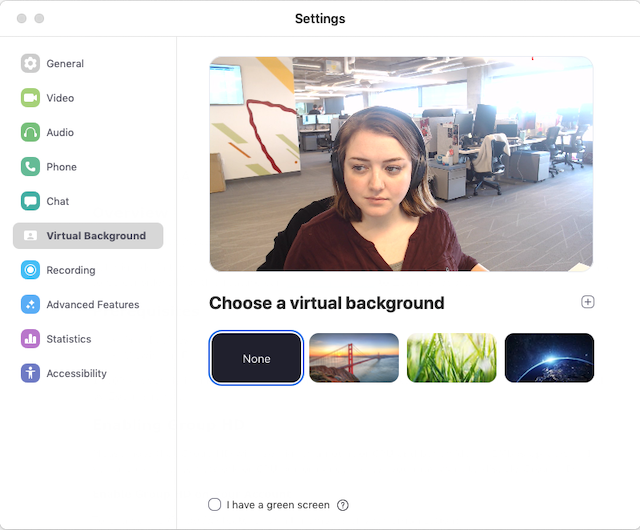 If you have already enabled virtual background, you can turn it on during a meeting. In a Zoom meeting click the ^ arrow next to Start/Stop Video. If you do not have the Virtual Background tab in your Desktop Client settings after enabling it, sign out of the client and sign in again. Ensure that the background is a solid color with minimal shadows. Also ensure the background is uniform in lighting. A 3 point lighting setup is ideal. Ensure that your green screen color does not match your shirt or eye color. If you continue to experience issues, contact Zoom Technical Support.